To say that I loved Jojo Moyes’ Me Before You would be an understatement. The book consumed me, gutted me, and has clung to my heart ever since I finished it. (Bumblebee tights!!!) Based on my love of the characters and Jojo’s one-of-a-kind writing, I knew that I would fall hard and fast for the long-awaited sequel, After You. I just wasn’t prepared to love it even more. After You picks up eighteen months from where Me Before You ended (an ending that had to have skyrocketed the sales of Kleenex, I would imagine), rejoining us with the brilliantly unforgettable Louisa Clarke. Finding her life irrevocably changed in the aftermath of tragedy, Lou suffers a unique (very Lou) accident that forces her to return home, face everything that’s happened to her, and piece her life back together. From her Moving On grief support group and the possibility of a new relationship to the introduction of an unexpected figure who turns everything upside down, Lou brings us along on her journey of living after loss. It’s a tale of healing, of family, of loving, and of just living, and I loved every heartbreaking, heartwarming, beautiful page of it. Lou Clark is hands-down one of my favorite heroines to come out of fiction in the past decade, and after Me Before You, her story begged to be continued. She’s entirely relatable, 100% real, and as a reader, I care about her so very much. All of Jojo Moyes’ characters spring to life off of the page, and reconnecting with the people I met in the first book felt like reuniting with old friends who I hadn’t seen in a while, but whose lives I’ll never stop being invested in. The new characters—especially Sam the paramedic (:::thump thump thump:::)—won me over right away, and never once did I feel any less connected to them than I did Lou and her family. Selfishly, I wanted to continue reading about this crew forever and ever and ever, but Jojo Moyes knows how to deliver a perfect story with a perfect ending, and After You is no exception. After You gorgeously conveys the pattern of life we all must face: loving, losing, and going on living. Like life itself, it’s tragic, funny, heartbreaking and full of hope—often all at the same time. Reading this book left me an emotional, blubbering puddle of feelings in a way that only the best fiction can do, and I know that it is one of those special, special novels that will never leave me. Jojo Moyes is such a gifted writer, and I’m so thankful that she has shared the gift of her talents with the world. 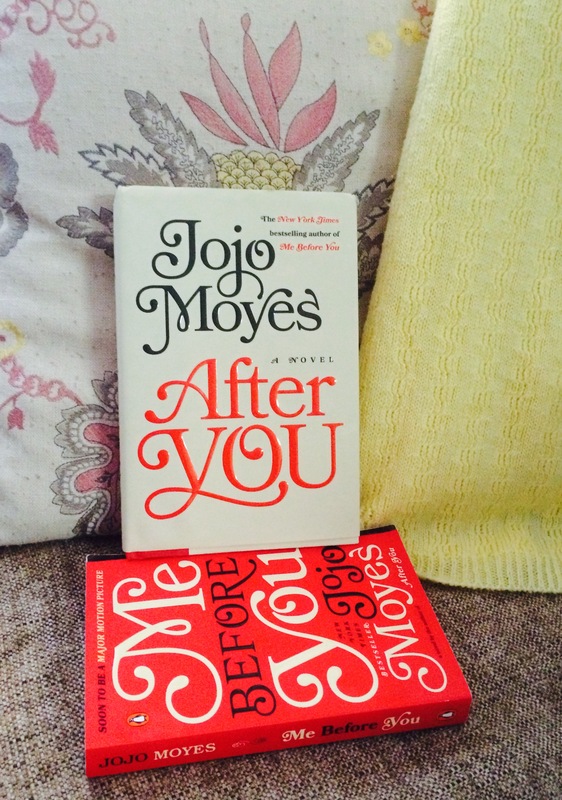 For more on Jojo Moyes and her amazing, amazing books, visit jojomoyes.com and follow her on Facebook and Twitter. Great review Stephanie! Your love for this book and it’s predecessor really shine through. Glad you enjoyed it so much!! Thank you! It’s easy to write about books this wonderful!